I made this meal for $4, for a family of four. The recipe is very adaptable, and is a great place to start for a simple baked chicken. A blank canvas, yet also delicious just as it is, simple. 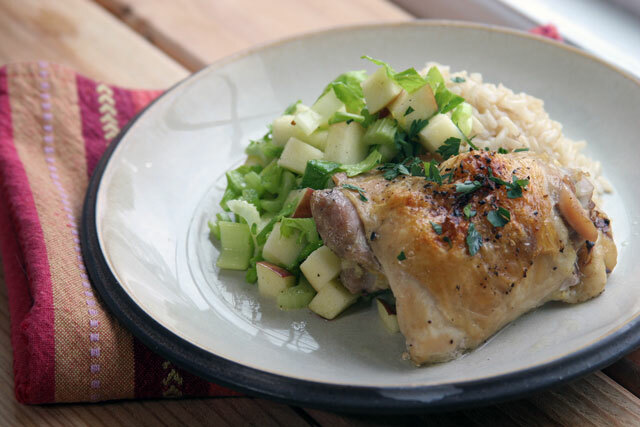 Baked chicken thighs $2, apple celery salad $1.00, and brown rice $1.00. The average working family on SNAP has about $4 per day per person to eat. $1.25 per meal per person needs creativity and time effective to get a healthful meal and balanced meal. That leaves processed foods as choices that people make to be able to afford food and be quick and easy. This country has steered us towards that type of eating. And everyone is to blame for this. But we can change, we can make a difference. It takes people to stand up for what they believe is right, and to do the right thing takes a voice and some courage. That is what The Giving Table has done for all of us bloggers. She has created a platform and is working with Share Our Strength to have our voices be heard. Because frankly, I am sick of this being a problem in our country. The land of prosperity and possibilities should not have a food problem like it does right now. A Place at the Table is a film recently made to help educate us on this subject. It is a must watch. You can watch the film online through Amazon, iTunes, or find a theater near you. I shop for rice, grains, and beans in the bulk section of grocery stores. It makes it more affordable and can mix and match grains and beans for maximum nutrition. 1. Rinse chicken thighs under cold water, and pat dry with a paper towel. 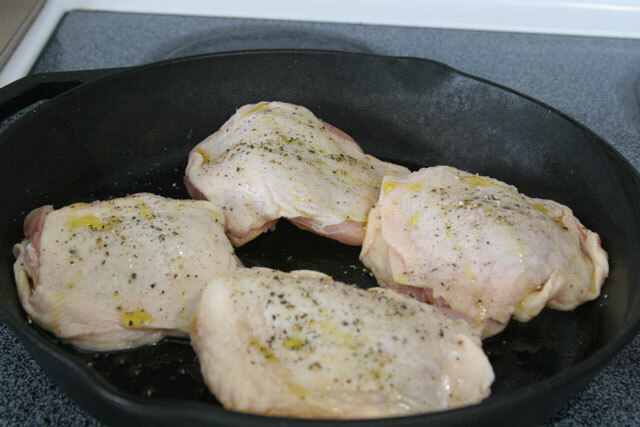 In a cast iron pan, pyrex, or any oven safe vessel place the chicken thighs and drizzle the olive oil to coat. Using about 1 tablespoon for all of the chicken. Take a pinch of salt, about 1/8 teaspoon, and sprinkle over the chicken. Next, do the same with 1/8 teaspoon of black pepper. 2. Place the chicken in the oven and cook for 20 minutes at 400 degrees. After 20 minutes lower the temperature to 375 degrees and cook for 20 minutes. When the chicken is done, the juices should run clear when poked with a knife. Chicken thighs should be cooked to 170 degrees when checked with a thermometer. Make sure not to hit the bone when checking the temp. Go for the center of the thigh, with the most amount of heat for the most accurate temperature reading. For the best crispy skin, turn the oven off and turn the broil on high, cook the chicken for 5 minutes under the broiler. Remove and serve. Adapting recipe: You can use different seasonings on this chicken to adjust flavor. For example use turmeric, ginger, paprika or garlic. Add lime juice/zest, or lemon juice/zest. If you have any questions let me know, I am here to help! 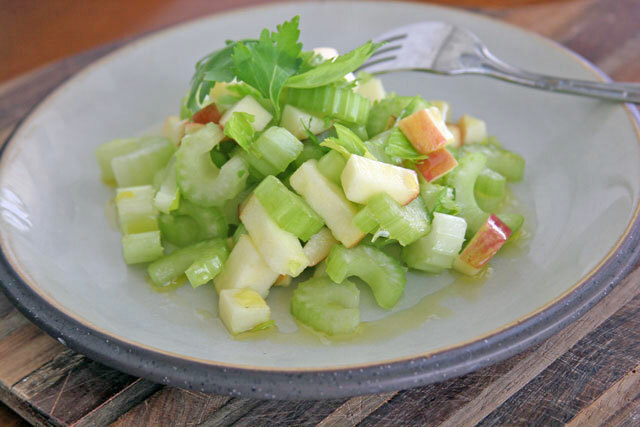 Serve with Apple Celery Salad and simple brown rice. I am happy to say Senator across the U.S. were tweeting, and emailing us, and me personally for this call to action. We made some noise in the New York Times, Huffington Post, and all over local new channels. This is just the beginning. Please do your part! Few decades ago, my relatives husband was VP for main chain ‘Stop n’ Shop’ grocers and during a visit watched her cook for their 5 kids. Now adults, 9 grandkids later, she still knows howto prep quick inexpensive meals even though her husband provided very well, after retiring. This is one ‘Chicken Thigh’ recipe I still make to this day and it’s a hit. Can bake several ways, but this recipe is nice change. Directions: 8-10, Skinless, or remove skin (if a cheaper purchase) Clean, pat dry. Meantime, dip in milk, then shake in bag with favorite seasonings (I use and eyeball, garlic salt, onion powder, oregano, paprika, pepper….heavy on Parmesan cheese, then mix in Italian or regular breadcrumbs). Shake and Bake at 350′ 45 mins/skinless, 1 hour. So delicious…..Enjoy. Easy, so economical. I love this sort of post so much, and am happy to do this. I work with kids here, teaching them cooking classes at the farmers market, and finding ways to connect them with their food. So this was a great cause to help with the hunger issue. Thank you! How awesome was it be be a part of this?!! !